Today is the six-year anniversary of the Convince & Convert blog. Since 2008, this blog and the community that surrounds it has grown from me and my Mom, to hundreds of thousands of marketers and businesspeople from all corners of the world. It’s been an amazing ride, and I thank every one of you for your support. But really, WHO ARE YOU? I don’t know, and I’m not sure YOU know. Here’s a 100% free way ($37 value) to find out in a just a couple of minutes. Until 7/7/14 the first 499 readers of Convince & Convert (that’s you!) can take the amazing How The World Sees You personality assessment for free. It’s a very quick process (5 minutes or so) and the findings are simply remarkable. You’ll understand your strengths and weaknesses in ways you never did before, and you’ll know how to improve your business and your life. You’ll receive a very detailed online analysis, as well as a downloadable PDF, all at no cost ($37 value). Editor’s Note: Thank you for your support – our codes have all been used! You can still take the assessment by paying the $37 fee. You’ll love it! 2. Enter the code JBAER where it says “book code” and enter your name and email address. Pick a password so you can access your completed assessment at any time. 3. Answer a few questions about yourself. 4. You’ll immediately receive your in-depth, custom report, which identifies your personality Advantages. Why Am I Giving This to You? 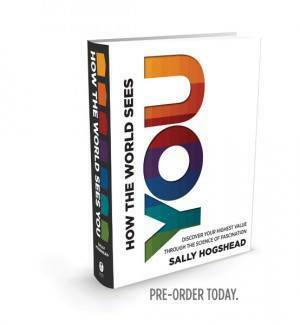 This assessment is produced by my friend Sally Hogshead, whose new book “How the World Sees You” is amazing and available for pre-order. Sally sent me an early sneak peek copy. She knows more than anyone about personality types and how to improve your life based on who you really are. To help promote the book, Sally gave me 499 (only) free assessments for Convince & Convert readers, so I can get a better feel for who YOU are as a group….and of course you get a better idea of yourself, too. I’d love it if you took the free personality assessment now. I promise you’ll LOVE it. 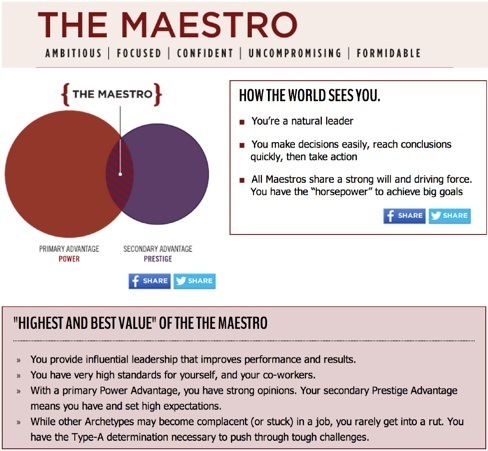 I’ve take this assessment myself, and of the 49 potential personality archetypes, I am The Maestro. Here’s what the assessment says about that (there are pages and pages and pages of more detail, this is just the summary screen shot). I can’t wait to find out what we’re all about. You’re going to learn a lot about yourself, too.